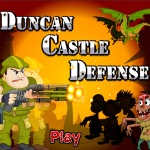 The free online game “Duncan Castle Defense” was added to the Arcade section of our website. In the game, your goal is to defend your castle against the continuous onslaught of zombies. Use your MOUSE to aim and shoot. Be sure to upgrade your weapons between the various rounds. Press the 1, 2 and 3 Keys on your KEYBOARD to move your man to another location. Be sure to note that this game is not mobile friendly so its best to play it on a desktop or laptop computer. To begin playing click here to go straight to the game, or you can go to urbanareas.net/games to visit the games section.